What is XTF At Home? 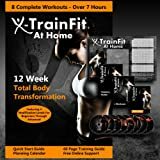 X-TrainFit At Home Training is a high intensity fitness program that is designed to be completed within the privacy of your own home or on the road. Very little equipment is just a set of dumbbells or exercise bands. Over 12 weeks, you will use the 8 intense workouts on the 8 DVDs to shred fat and sculpt and tone muscle. Don’t worry, you won’t be bulking up, you’ll be building a slimmer, fitter you. Each video demonstrates a modified level of difficulty throughout ranging from level 1 for beginners to level 4 for advanced users. You can pick a modification level that challenges you then try and push it to the next level when ready. You will complete the videos with varying frequency and in varying order depending on the period of the program you are in as outlined in the quick start guide provided. You will also receive the complete 60 page Training Guide, Motivational Poster, and access to online support from a certified XTF Trainer.